Uh oh. 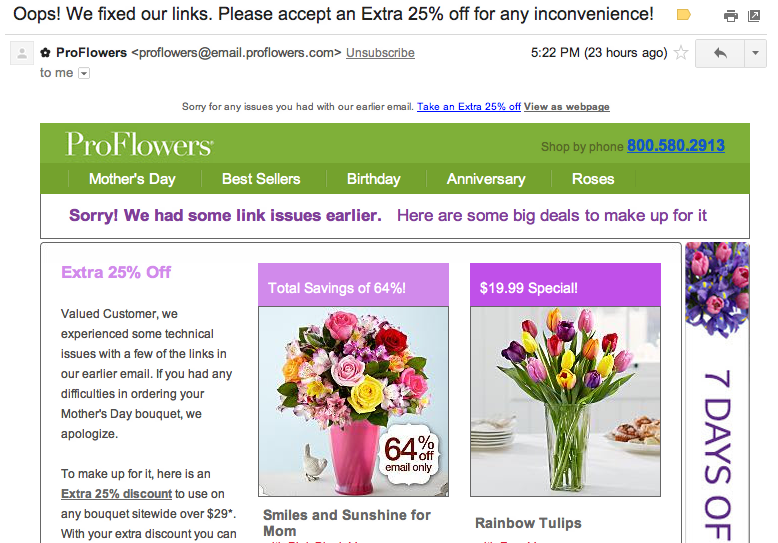 I had a ton of emails from Proflowers in my “to write about” label in my Gmail account, because they had been pretty persistent with their Mother’s Day emails. They’ve been trying a bunch of weird tactics with icons in their from name and going pretty over the top with their urgency messaging. 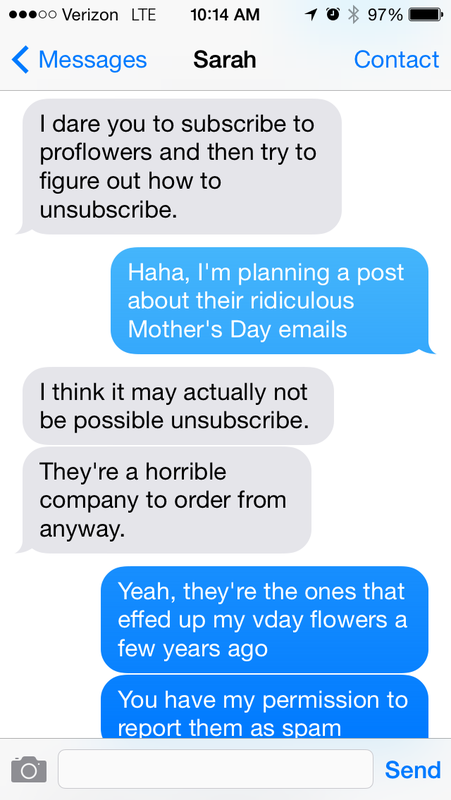 So I was already planning a post about them for next week when I do my Mother’s day roundups. But a CAN-SPAM violation? Now THAT gives me a sense of urgency. I checked the link from my phone to be sure, and there it wasn’t. I could SUBSCRIBE to their emails, but the only thing remotely resembling an unsub was a preference center. I clicked on that, and the link didn’t work. (I was planning on putting a screenshot of their footer here, but the font was such a light shade of grey that it’s almost impossible to read. But that could be due to me testing out a new contacts prescription). So like any modern email subscriber activist (Is that a thing? Can we make that a thing? Hashtag #emaillorax), I took to Twitter to see what’s up. Mind you, I never asked to unsubscribe. This isn’t my first online run-in with this company. A few years ago, my boyfriend (now husband!) sweetly ordered me flowers for Valentine’s day to be sent to my office. He gchatted me around 5 PM and asked if I got them. They never came. So, trying to be a good boyfriend, he just went to a local florist and got me other flowers. There were a few missed deliveries over the next few days. 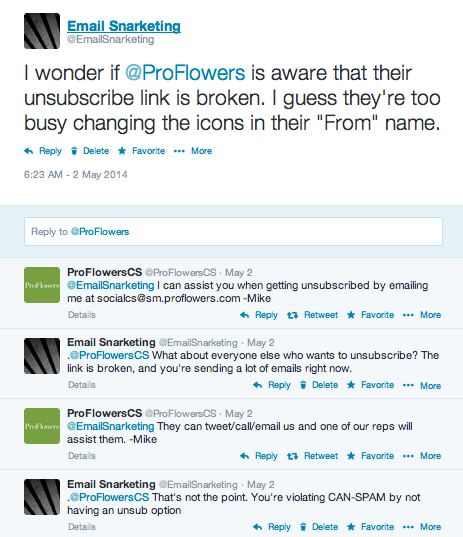 I was mad at Proflowers for making him worry about it (and for me not getting flowers at work on Valentine’s day), so I wrote a post on my blog at the time, and eventually people from their customer service team contacted me, gave him a refund and sent me free flowers in March. (Which was awkward when my coworkers asked about them. “Oh, they’re for Valentine’s day! I just got them!”). So, yes, they screw up sometimes, but they do try to make it right. They didn’t exactly acknowledge that it was the unsubscribe link that was broken (but for all I know, there were others), but they at least had in fact fixed the preference center link. And they had an opportunity to have another touchpoint with their subscribers. Not that they’ve been remotely conservative in that department – I’ve gotten nearly daily emails from them in the last few weeks, and they’re all pretty “urgent.” They keep saying that it’s the last chance to get a certain discount, and then sending a better discount 2 days later. I’ll look at all of them after Mother’s day and see when the best discount actually happened. Once I got to the preference center, it was actually pretty nice – it lets you opt-down for email frequency, and you can check if you want promotions for holidays (which is what I’ve been getting). It even allows you to select to receive reminders based on previous purchases, which seems like a great idea for birthdays and anniversaries. So, Proflowers – we’re okay now. But I’ll be watching you.